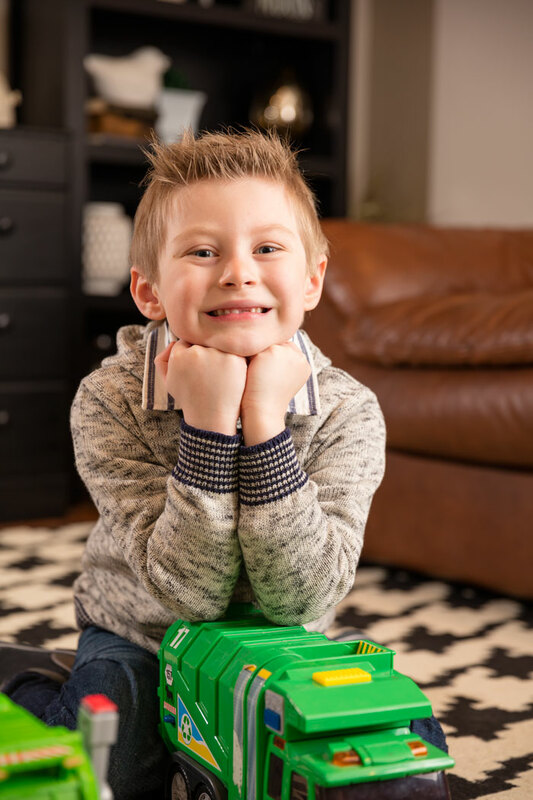 Connor Hoit and his parents had their world turned upside down after Connor was diagnosed with acute lymphoblastic leukemia at age 4. Lori and Oscar Hoit of Austintown are still waiting for their “new normal” to kick in after their son, Connor, was diagnosed with leukemia last year. Until then, it’s one day at a time, if not one second at a time, as they try to adjust to their new lives as parents of a child with cancer. For the Hoits it began in mid-March 2016. Connor, who was 4 years old at the time, had been battling a GI virus and wasn’t being himself. He wasn’t eating well. He took more naps than normal and complained of leg and belly pain. He’d been to his pediatrician twice in the previous 2 months and tested negative for strep and flu viruses. The Hoits insisted on a blood test. Sure enough, about 2 hours after leaving the appointment, Lori and Oscar received a call with results from the blood test. Their pediatrician told them to go immediately to Akron Children’s Hospital in Akron. It appeared that Connor may have leukemia. From there, the Hoits’ world turned upside down. At Akron Children’s, a diagnosis of acute lymphoblastic leukemia (ALL) was confirmed. Connor was admitted to the Pediatric Intensive Care Unit (PICU), where that night he had a blood transfusion. The next day, he underwent surgery to have a port placed in his chest so chemotherapy could start right away. “At that moment, you’re devastated and heartbroken,” Lori said, describing how her family’s life was changing before her eyes. Lori Hoit says she gets her strength from the bravery of her son, Connor, as he battles cancer. Jeffrey Hord, MD, director of the division of hematology-oncology at Akron Children’s, sees stories like the Hoits’ play out on almost a daily basis. Connor achieved remission within 30 days of starting treatment. But remission isn’t without its challenges, including a barrage of chemotherapy medications – from daily and weekly pills at home to monthly IVs. He also undergoes quarterly spinal taps at the hospital. He had to delay starting kindergarten because of his treatment schedule. His parents also kept him home through the cold and flu season due to his compromised immune system. As their journey continues, the Hoits draw encouragement from their faith, the support of family and friends, and from Connor’s fighting spirit. Hear more about Connor’s story – and those of other patients in the Mahoning Valley – by tuning in to the 9th annual Miracles & Promises Radiothon, broadcast live from Akron Children’s Beeghly campus on Mix 98.9 or 570 WKBN Sept. 28 – 29. Visit miraclesandpromises.org to support the Radiothon.